WikEmacs (pronounced wikimacs) collects useful resources for working with GNU Emacs. It is intended as a next generation alternative to the traditional EmacsWiki. You can call it A Community Maintained Emacs Wiki. We need more WikEmacs Contributors. Emacs is available on all popular Operating Systems including GNU/Linux, OSX and Windows. It supports a variety of programming languages. Explore this wiki using one of these trails. Custom for choosing and setting options. Scripting your init.el file (formerly .emacs) using Emacs Lisp . Emacs supports a wide range of Markup languages to help you in your workflow of document creation. Using emacs as a browser's external editor, either when entering text on web pages or when viewing a web page's source document or both. eshell is a shell (not a terminal emulator, nor a process hosted in one) written in pure Emacs Lisp . It is very powerful, flexible and customizable, but poorly documented at time of writing. Emacs itself is fully functional either in a terminal or a windowing system. Some keystrokes available under window systems may not work in a terminal and vice versa. Emacspeak for the visually impaired. 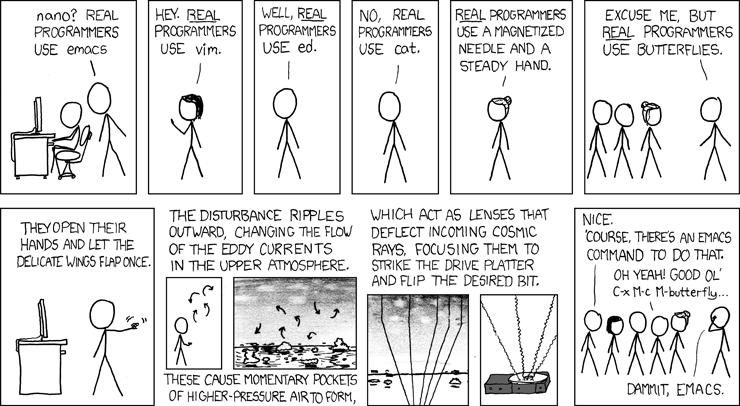 Try M-x butterfly on your Emacs right now and unleash it's powers. Adding Emacs-style key bindings to other programs and operating systems.